Arthur Raistrick was born in 1896 into a working class family in the model industrial village of Saltaire in Yorkshire. His mother, Minnie, together with other relatives, worked at the famous Salt’s textile Mill. His father, George, was an engineer and a socialist. Arthur’s family came from the Dales and were employed in farming and lead mining. His four grandparents came from four different Dales. Together with his ethical socialism, walking, engineering, mining, the Dales landscapes and an abiding affection for its people were to animate the rest of Arthur’s long and productive life. After he left school he became an engineering apprentice at Shipley Electric Works and also attended evening classes. But the war intervened. Arthur was an ardent pacifist, so in 1915 he gave up his apprenticeship and, together with his uncle, addressed numerous anti-war meetings across the north, experiencing his share of rough handling – “but we didn’t mind”, he later declared. None of this reduced his political commitments. During the depression of the early 1930s, for example, he toured the stricken south Wales coalfield, speaking at miners’ welfare clubs and visiting camps for the unemployed. Once again war was to impact upon his life. As one of the founders of the Pacifist Advisory Bureau for the north, he refused to engage in military research for the university. As a result he was suspended without pay for the duration of the war. To survive, Arthur and his wife Elizabeth moved to a smallholding in Wharfedale where they grew much of their own food and left any surplus on needy neighbours’ doorsteps. But although they took the food, some never spoke to him because of his pacifism – even decades later. After the war, he was reinstated to his lecturing post. He is credited with founding industrial archaeology as an academic discipline. Later he became president of the Ramblers’ Association and with some friends, he began to excavate the now famous industrial museum and world heritage site in Coalbrookdale in Shropshire. However, when it came to the official opening Arthur was not invited because he would not bow before the royal visitor. He also played a part in developing the Beamish open air industrial museum near Chester-le-Street in the northeast. 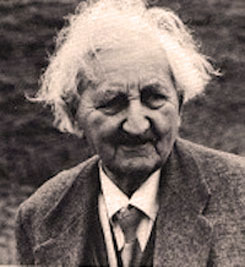 Arthur died in 1991 aged 95. The Yorkshire Dales Society of which he was a founder member, declared him ‘The Dalesman of the Millennium’. They also installed a limestone bench in the meadowland picnic area of Grassington to commemorate his life and work.